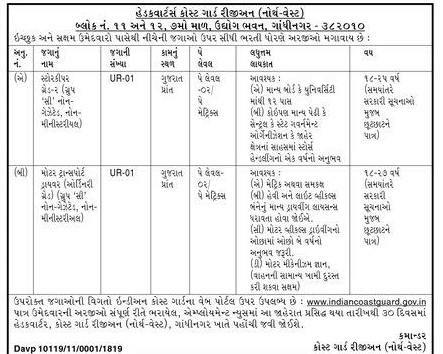 Indian Coast Guard Region (NW) has published Advertisement for below mentioned Posts 2018. Other details like age limit, educational qualification, selection process, application fee and how to apply are given below. 12th pass from a recognized university. Matriculation or equivalent. must possess a valid driving licence for both heavy and light motor vehicles. should have at least two years experience in driving motor vehicles. Address to sent Applications: Headquarters, Coast Guard Region (NW), Gandhinagar.